H.E.S.S. 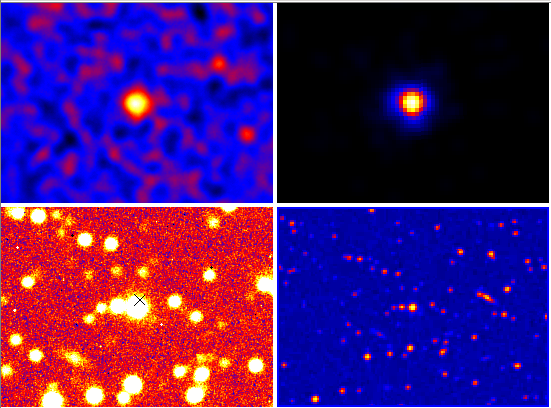 gamma-ray map (upper left), Swift/XRT count map (upper right), optical count map by ATOM (lower left) and optical DSS map (lower right). The small cross on the ATOM map denotes the radio (NVSS) position of the source. PKS 1440-389 is a blazar which, despite many measurements in different wavelength ranges, has a redshift which remains unknown. The source is bright in the Fermi-LAT data, in radio and in X-rays. A simple extrapolation of the well-defined MeV to GeV spectrum to very high energies (VHE; E> 100 GeV) made this BL Lac object a very good candidate for gamma-ray emission at VHE. The H.E.S.S. array targeted the source in a short campaign in February, April and May 2012 for a total amount of 8 hours of good-quality livetime. This campaign was successful and a significant detection was announced in the Astronomer's Telegram #4072 on April 27th, 2012. PKS 1440-389 is a point-like source at VHE. Its preliminary flux is estimated to be about 3% of the Crab Nebula's above 200 GeV. No significant variability has been detected in the H.E.S.S. data. Since it had been proposed for observations with H.E.S.S., PKS 1440-389 was also monitored in the optical with the ATOM telescope on the H.E.S.S. site, resulting in mean fluxes of 15.33+/-0.06 mag and 15.23+/-0.06 mag in the B and R bands, respectively. The Swift satellite observed the source at three different epochs (2009-09-23, 2011-02-03, 2012-04-29). The last observation was triggered by the H.E.S.S. ATel, and resulted in a clear detection 0.3-7 keV range, see ATel #4098. The map of the gamma-ray excess seen by H.E.S.S. from the position of PKS 1440-389 is shown in the top image, together with the maps at other wavelengths. The spectral energy distribution (SED) of PKS 1440-389 is shown in Fig. 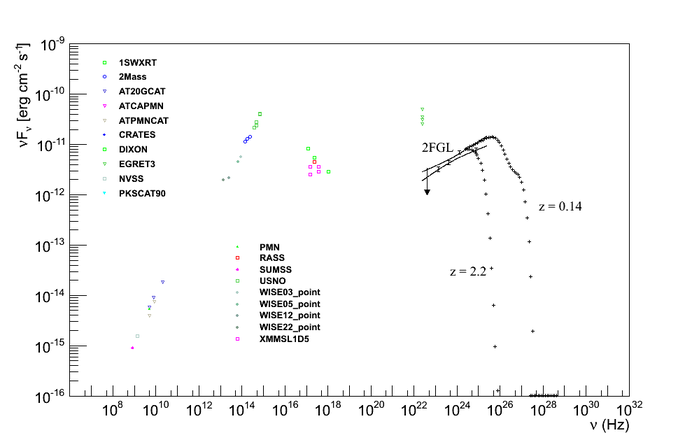 1 together with the Fermi/LAT spectrum published in Nolan et al. (2012) and the public data from all the missions which observed the source at all wavelengths. The SED exhibits the usual two bumps, one at low frequencies, from radio to X-rays, and the other at higher frequencies. The low-frequency component is thought to be due to synchrotron emission by relativistic electrons moving inside the jet of the blazar, while the higher-frequency component is generally attributed to the inverse Compton scattering of the electrons off the photon field. A very recent catalogue of BL Lac redshifts indicates that the source could be located between a redshift of 0.14 and 2.2 (Shaw et al., 2013). In Fig. 2, the two sets of points extending from the 2FGL spectrum show what would be the effect of the onset of gamma-ray absorption on background photons, for the two redshifts. The H.E.S.S. spectrum, once derived in its final form, will help in limiting the redshift range of PKS 1440-389. Fig. 1: Spectral Energy Distribution of publicly available data across the electromagnetic spectrum. All the data shown here are publicly available at the ASI Science Data Center.